This building was the original site of the Badger State Bank. In 1926, a group of local businessmen determined that the growing Denmark community could benefit by having another banking option to handle their financial needs. They raised capital by selling stock at $120 per share. The group received their state charter, and the first meeting of stockholders was held on October 21, 1926. Progressive business owners in the village served as the first Board of Directors and their business offices served as their first meeting places. They were: Albert Dufeck, Ed Schuster, Albert Skornichka, Nic Knutson, Charles Skornichka, J. B. Broeckman and Harry Hansen. Albert Dufek was elected President and J. B. Broekman was elected Vice President. Plans for construction of the two story bank building began in early 1927 and the formal opening was held on June 4, 1927. Charles Skornichka agreed to serve as Secretary and Cashier for a term of one year. On March 1, 1928, he resigned and returned to his insurance and real estate office on the second floor. Anthony A. Mauer accepted the position of Cashier and was added to the Board of Directors. Other professional offices on the upper floor were Dr. Frank Hager, MD, Dr. W. J. Schleis, DDS, and Charles Denissen, Attorney. In 1972, the Bank moved to its new location on Wisconsin Avenue which in the Village's early days was the site of the Wenzel Schleis saloon and later housed a bakery owned by Roger Levenhagen. 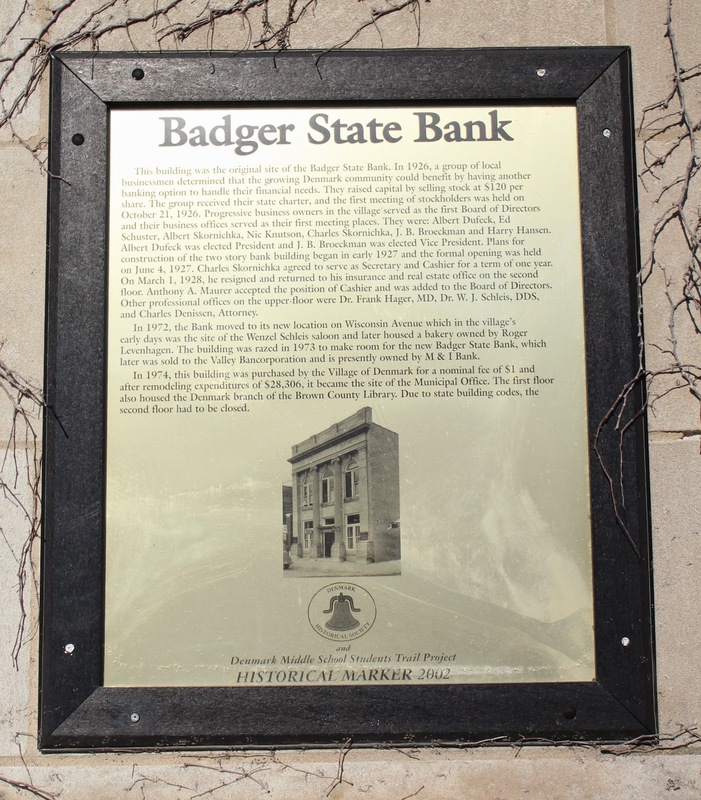 The building was razed in 1973 to make room for the new Badger State Bank, which later was sold to the Valley Bancorporation and is presently owned by M & I Bank. In 1974, this building was purchased by the Village of Denmark for a nominal fee of $1 and after remodeling expenditures of $28,306, it became the site of the Municipal Office. The first floor also housed the Denmark branch of the Brown County Library. Due to state building codes, the second floor had to be closed. 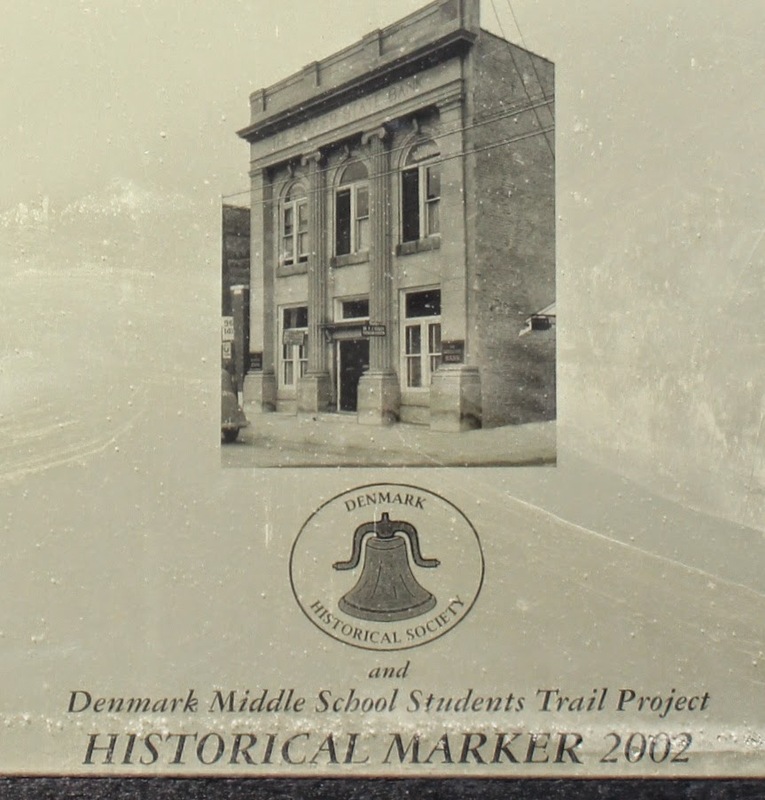 The marker is located at the Denmark Village Officers on westbound Main Street, west of its convergence with Wisconsin Avenue / County Highway T, at or near 144 Main Street, Denmark, Wisconsin 54208. The marker is mounted to the facade of the building, on the far right.